Continuing from the previous post, I wanted to share the final article mentioned, written by Lyn Gardner in her Theatre Blog for The Guardian, Is the playwright dead? Most of the theatre my students make is collaborative and new, applying and testing the creative skills and performance theory they have learned. However, they are also empowered by interpreting a written text and are challenged by that process in equal measure. As always, I find myself agreeing with Gardner. I have left her original links in the article as they lead to further interesting reading. “There has been a shift of opinion against playwriting, in favour of collective methods of theatre. The very activity of playwriting has been attacked as individualistic, undemocratic and even immoral,” declared playwright David Edgar when it was announced that he would be this year’s visiting professor in drama studies at Oxford and giving lectures and hosting discussions in February. Blimey! Edgar talks of an “anti-writer trend”. That sounds serious and worrying. I’d like to think that he was being a little tongue in cheek because, after all, he also pointed out that “for the first time in at least 100 years, new work has overtaken the old work in the repertoire”, which can surely only be a good thing for writers of all kinds. Then there’s the roll call of people he’s invited to take part in discussions over the week, who include, among others, Bryony Lavery, David Greig and Chris Goode, who definitely all write plays but who often also create work in many different ways via collaboration, and for whom text plays distinct roles in different contexts. When I was talking to Scott Graham of Frantic Assembly recently, he talked eloquently about working with Bryony Lavery on Stockholm and how she expressed the wish to write silence, condensing a scene to the point where “words were redundant”. That’s still very much writing in my book, and I bet most other people’s, too. But even if what Edgar is saying is just a provocation, I’m really not sure that talking about an “anti-writer trend” is either true or helpful. After all, the adaptations of The Curious Incident of the Dog in the Night-Time or Let the Right One In are still distinctly scripted plays however many other tools have been utilised to make them. And why wouldn’t all theatre-makers – and that includes playwrights – use all the tools available to them that they find helpful for a particular piece of work? The danger is that Edgar’s statement sets up the idea that different kinds of theatre are in opposition to each other, and that the individual playwright must be at odds and in competition with those making work collectively or collaboratively or using other kinds of theatrical languages. It’s not a case that one kind of theatre-making invalidates another or steals money and resources away from others. 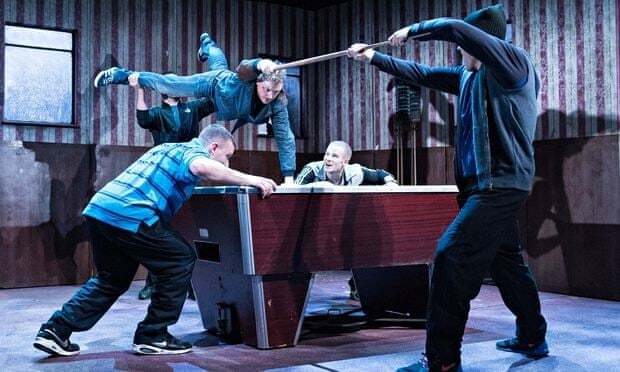 There is room for all comers and different ways of working because different is good and invigorating – and variety adds to the richness of our theatre culture. What suits some as a way of working will not necessarily suit others or perhaps only at particular points in their career for particular projects. Bryony Lavery can work fruitfully with Frantic Assembly and write plays entirely on her own, too. Doing one doesn’t mean you can’t do the other. Does the fact that we have a variety of methods of working mean that the individual playwright with a singular vision is an endangered species? Of course not. You only have to look at the programmes of our new writing theatres to see that’s not the case. The fact that……. theatres across the country may also programme other kinds of work, some of it made collaboratively, simply reflects the fact that most of those now directly involved in new writing understand that what is needed is a far wider and looser definition around what we mean by new writing. That doesn’t threaten the playwright; it potentially liberates and provides more opportunities. David Edgar’s week of lectures and discussions do sound fascinating – you can read the programme and participants here. They will all be published online so watch this space. Today, I have stumbled across an astonishingly fascinating series of video recordings and I am compelled to share them straight away. They come from Humanitas, a series of Visiting Professorships at the Universities of Oxford and Cambridge which brings together leading practitioners and scholars to explore major themes in the arts, social sciences and humanities. In one of the strands, Drama Studies, the visiting professors so far have been actor Vanessa Redgrave, director Greg Doran, playwright Athol Fugard and will be joined this year by another playwright, David Edgar. All of them are giants in their respective fields. Fugard speaks in three videos; firstly about the defining moments in his life and work, then about staging his plays and finally about his playwrighting process. In his first video Doran gives a practical masterclass looking at what clues Shakespeare puts into the verse for the actor and in the second, another, masterclass, this time on how Shakespeare spins rhetoric for the actor. However, my favorite, are the series given by Redgrave, doyen of the theatre on both sides of the Atlantic as well as prominent social activist. Click on the image below to take you to the first of a series of four lectures and panel discussions, entitled, not surprisingly, Theatre and Politics. The 2015 series, with David Edgar, promises to be equally interesting and provocative as he explores contemporary playwrighting from a number of perspectives. In an article in The Guardian born out of his appointment as Humanitas Visiting Professor, entitled Is the playwright dead?, he is quoted talking about the anti-writer trend that he considers to be prevalent in current collaborative theatre making. This notion will form the basis for his first lecture and the article itself, my next blog post. The word Mummer can be traced to Greek mythology. Momus was the personification of satire, mockery and censure. 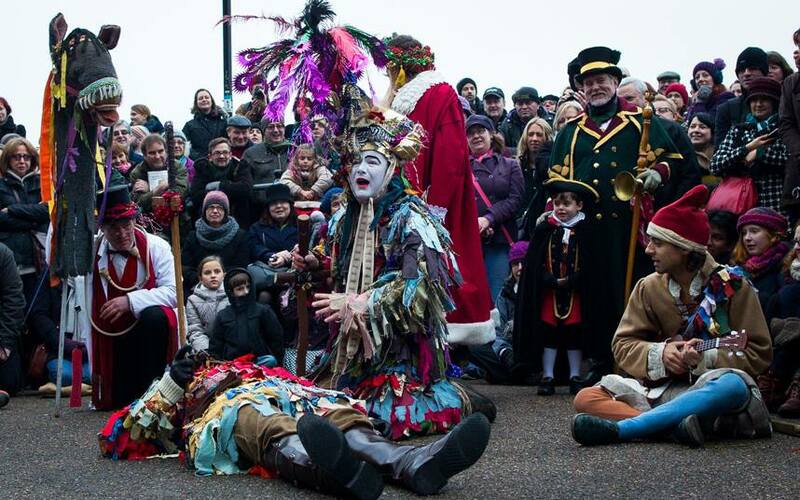 Mummer can also be connected to the late Middle English word mommer and the Old French word momeur. Each relates to miming, masking and folk play. There is a short but comprehensive history of Mumming and its origins, written by Peter Millington, which you can read here. Millington comments that the exact history is unclear and there are a range of views with regard to the real origins. He points to an even more interesting source of information and research by the Traditional Drama Research Group (TDRG), based at the University of Sheffield. The TDRG site is simple, but full of interesting information including many original texts. I was reminded of a recent presentation given by a student of mine, Sidney, on the Irish tradition of Wren Boys which is associated with Mumming in Ireland, where it is also still performed. Perhaps what surprised me most though is that Mumming is still alive and well in Philadelphia, in the US, where there is even a museum dedicated to the form. There is some fascinating (silent) footage from British Pathé which shows the Philadelphia Mummers parade from 1927. Clearly the American version of Mumming has evolved radically from its original European form, but its roots are evident. In the unlikely event I ever find myself in London in the middle of a freezing European winter, I shall certainly be taking a look at this great theatrical tradition. All short, but perfectly formed and super starting resources.